Mad Catz is extending its quirky Cyborg gaming peripherals range with a wireless RAT 9 mouse and the G.L.I.D.E 7 'gaming surface'. The eccentric Cyborg RAT 7 has attracted both mirth at just how ridiculously customisable it is and glee at how fantastically it handles, and it has now been joined by a wireless version: the RAT 9. Mad Catz is hoping to get away from the eternal problem of gamers worrying about batteries running out or problem charging with a tether by offering two lithium ion rechargeable battery packs, allowing you to swap from one to the other. The charger also doubles up as store for the weights that you adust when you get the mouse and, probably, never really touch again. As you may expect, the mouse also offers 2.4Ghz wireless tech – and latency of less than one millisecond. 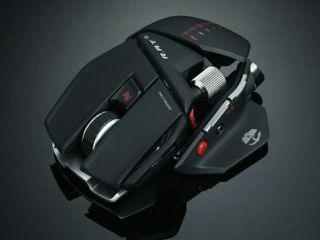 The RAT 9 will cost a whopping £119, so it's very much a mouse for those who take their gaming particularly seriously. Next up is the G.L.I.D.E 7 which is billed as a 'gaming surface' and is, therefore, a nice mouse mat. We're not sure what G.L.I.D.E is an acronym for, but it does offer a foam backed, laser cut, low-friction surface and has been made in conjunction with pro gaming clan TCM. Darren Richardson, President and Chief Executive Officer of Mad Catz commented, "The RAT range of professional gaming mice continues to impress at retail, and critics and consumers alike appear to be universal with their praise. "The RAT 9 introduces next generation wireless technology to the range which we believe makes this the most advanced gaming mouse available. "When used in conjunction with one of our new gaming surfaces, we believe we are able to offer PC gamers the ideal mouse installation." We don't have a price of the mouse mat and we are chasing a UK release date for both – but expect it to be imminent.